X-ray fluorescence (XRF) imaging is a powerful technique that allows quantitative and non-destructive analysis of elemental compositions, across large areas at very high sensitivity and moderate resolution, and under atmospheric conditions. A staple technique at synchrotrons worldwide, laboratory-scale instruments are surprisingly rare given the method’s wide applicability. 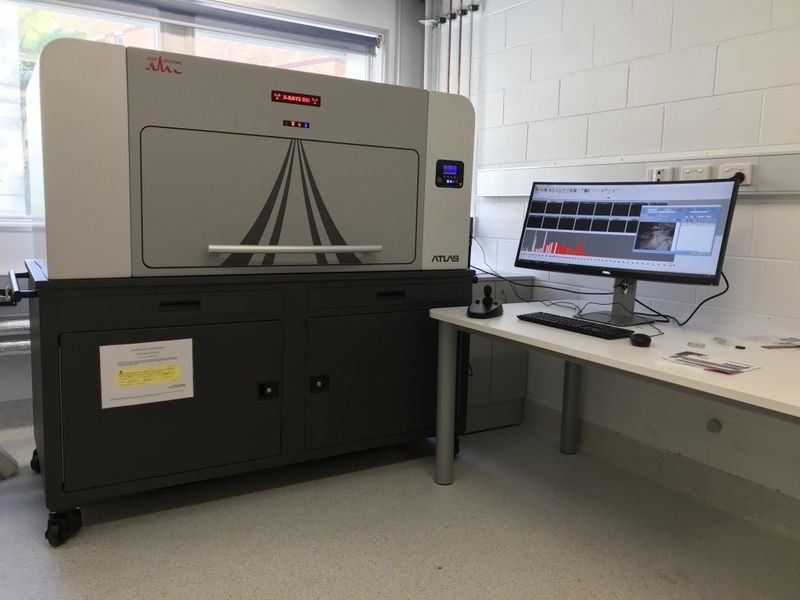 The modified IXRF ATLAS X instrument in place at the CMM is capable of both mapping and spotwise analysis on samples up to 300 x 300 mm, at a resolution of 25 um, for all elements heavier than Na, and can run at both low-vacuum and atmosphere. Compared to SEM-EDS, XRF has an order of magnitude higher sensitivity for first row transition metals and most heavy elements, scans much larger areas, and can be performed under atmosphere with minimal sample preparation. It is an ideal first-line approach for many samples, allowing rapid analysis of composition and morphology over much larger areas than are practical by electron microscope, and identifying areas of interest for complementary EPMA, HRTEM, micro-diffraction and other localised studies. The very high sensitivity and throughput of µXRF is also critical to a wide range of advanced applications, such as imaging elemental distributions in sensitive specimens, include live biological organisms (eg. plants), detection and mapping of trace elements in a range of materials, and analysis of very large specimens such as geological cores.